Your use of the website and its content grants no rights to you in relation to any copyright, designs, trademarks and any other intellectual property and material rights relating to the content (as described in the content section below), including Jules B software and all HTML and other code contained in this website. All such content, including third party trademarks, designs and related intellectual property rights mentioned or displayed on this website are protected by national intellectual property and other laws and international treaty provisions. You are permitted to use the content only as expressly authorized by Jules B and/or its third party licensors. Any reproduction or redistribution of the above listed content is prohibited and may result in civil and criminal penalties. In addition to the Intellectual property rights mentioned above, "Content" is defined as any graphics, photographs, including all image rights, sounds, music, video, audio or text on this website. Jules B tries to ensure that the information on this site is accurate and complete. Jules B does not promise that Jules B content is accurate, error-free. Jules B does not promise that the functional aspects of the website or Jules B content will be error free or that this website, Jules B content or the server that makes it available are free of viruses or other harmful components. We always recommend that all users of the Internet ensure they have up to date virus checking software installed. In all cases of free shipping promotions, the shipping charge only will be deducted. No taxes, duties or customs charges will be removed. Some brands and designers are excluded from promotions / discounts: Unless explicitly stated. Other exclusions may apply. Jules B offers a Sale Price Promise on items purchased up to 3 working days prior to the start of a sale. Please be aware that the exact style and size of an item must be available online at the time your request is made before any adjustment in the RRP price can be approved. Only the difference in price will be credited excluding any shipping costs. All approved Sale Price Promises will be credited in the form of an online credit which will be valid for 6 months. Refunds to credit or debit cards are not available. If we discover that a pricing error has been made, we reserve the right to suspend your order and contact you to ask whether you wish continue with the order at the correct price. We will not be obliged to supply goods at the incorrect price. We present our content 'as is' and make no claims to its accuracy, either expressed or implied. We reserve the right to amend errors or to update product information at any time without prior notice. We accept all major credit/debit cards for payment as well as Jules B online credit. If your credit card is rejected by our online payment processing systems, please double-check that all the details you entered on the website were correct. Your name and address details must match the card - holder address details held by your card issuer. If the problem persists, please contact your credit card provider. This scheme allows you to receive a point for every dollar you spend online. When you reach 500 points you will automatically receive a $20 credit note (via email) to be redeemed on your next purchase. Please note that vouchers expire 3 months after the date they were issued. The loyalty scheme 'B-Rewarded' is subject to change and does not affect your satisfactory rights. Please note that Vouchers with 'Free Delivery' are only valid in the UK. Vouchers are only valid on current season, full price stock unless stated. Vouchers expire over after 90 days. Please note we do not use mail forwarding companies and are unable to accept BFPO orders due to limitations with our courier services. We are sorry for the inconvenience. Please note returned products must be packed with a note (document included) stating the goods are returned products. Failure to do this will result in import duties being removed from the amount refunded, at the customers expense. We strongly advise you make it clear that the product is a return. 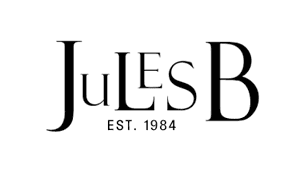 We cannot accept returns or exchanges on lingerie, underwear, pierced earrings and swimwear purchased on the Jules B website.